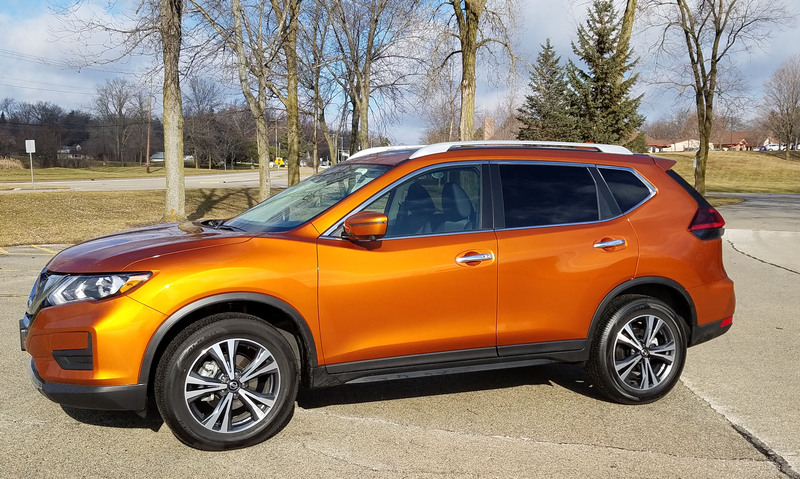 Barely a year had passed since I tested Nissan’s revamped Rogue, one of the best-selling small crossovers on the market, and particularly popular in the Milwaukee area. This is Nissan’s No. 1 seller and it’s obvious why. It looks refined, drives fine and is economical. As I said previously, what Rogue doesn’t do is stand out in any major way. However, the test vehicle was a bright Monarch Orange, a metallic burnt orange that did stand out, at least in the parking lot’s sea of gray, white and black vehicles. I like the Rogue because it’s such a good buy. The base S model lists at $27,195 with delivery. I tested the next level up, the SV with AWD. 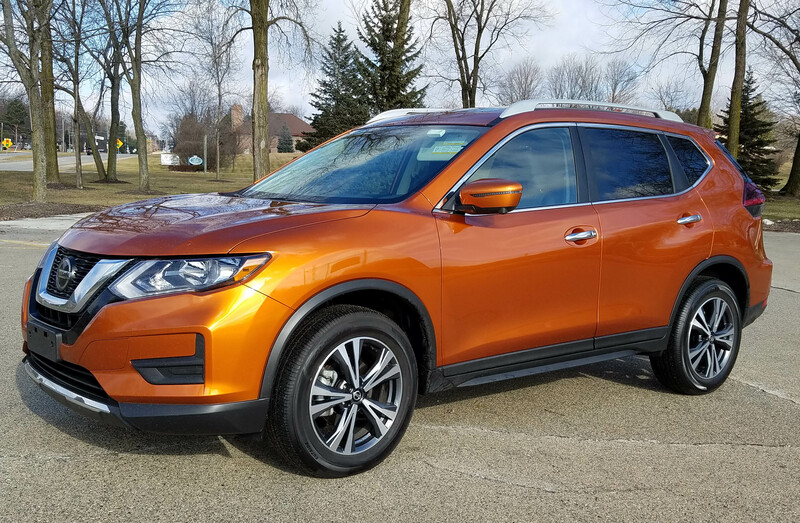 It lists at $28,615 and with options the orange tester checked in at $32,770, several grand below today’s average new car price. Ride seemed improved in the Rogue as last year’s was a bit choppy, and I had both during cold weather that tends to stiffen suspensions and harden tires. 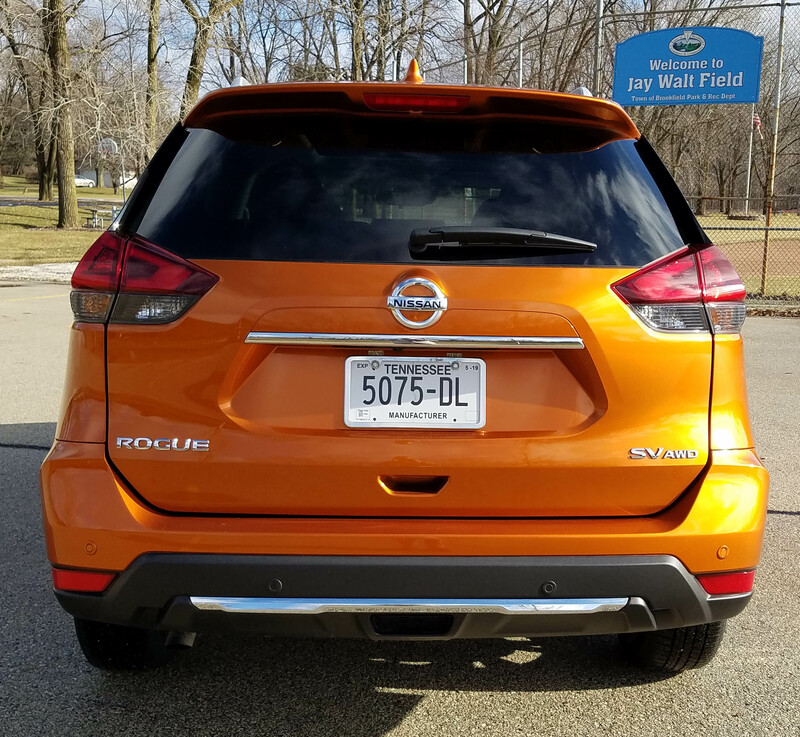 Riding on a 106.5-inch wheelbase the Rogue should behave well on choppy Midwestern roads. While severe bumps and potholes still were felt, overall the ride is much less harsh than before. Power is mid-range for the market, Nissan’s 2.5-liter I4 delivering 170 horsepower and a torque rating of 172. 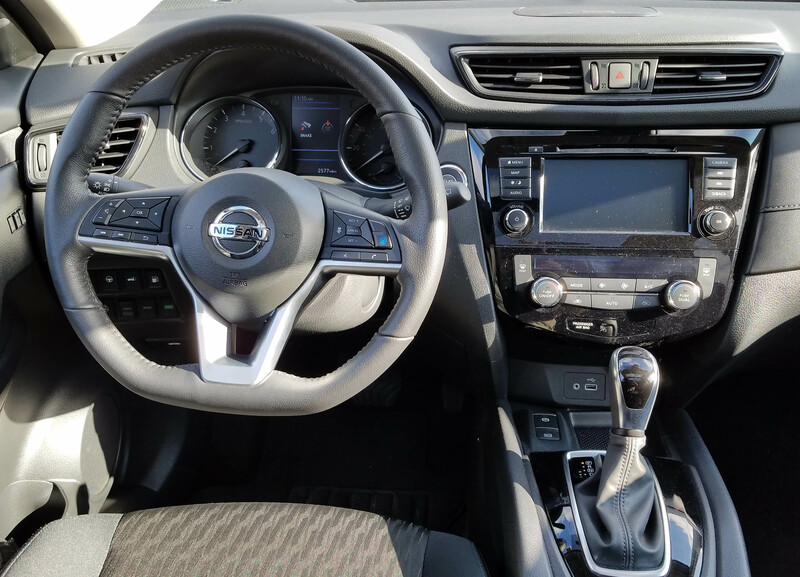 Acceleration is mild, but smooth via Nissan’s automatic Xtronic CVT. There is a Sport drive mode button on the lower left dash to help pump up the revs and low-end power. 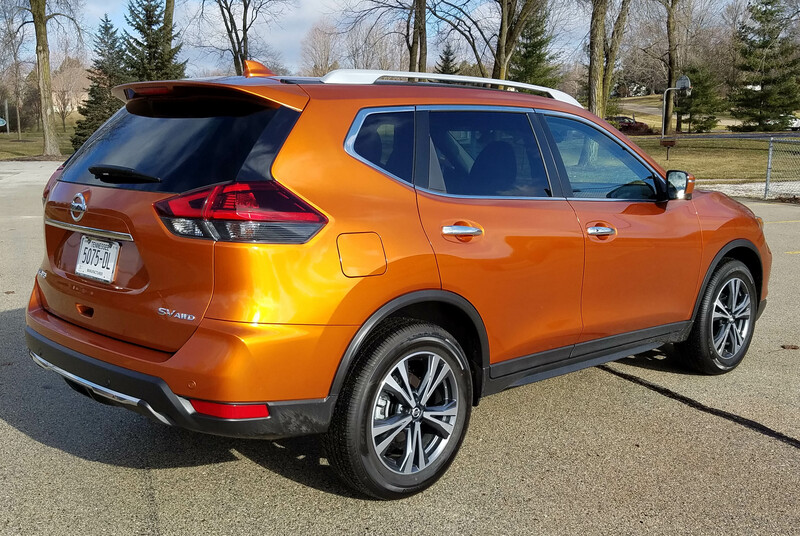 It helps a bit, but not a bunch, to give the Rogue more oomph away from a stoplight. Steering is light, but spongy with a numb feel to the wheel. It’s easy to keep in its lane, but last week’s Subaru Forester felt more responsive, more fun to drive. Still, the Rogue is easy to park and maneuver in tight spots and that light wheel may be welcome in city driving. Naturally the safety gadgets are in full array here, especially after the $3,530 Sun & Sound Touring package was added. It includes ProPilot Assist, a semi-autonomous driving system. Think lane departure assist on steroids. It works in conjunction with cruise control and lane departure. When engaged it makes small corrections to your steering to keep the Rogue centered in its lane. It does the same when rounding curves so long as the system can see both the center and side lane markings. As I had last test drive, I used this on the highway and it was fine, but you must get used to the wheel twitching a bit in your hands as it corrects your steering. Yet this seemed less twitchy than last time, so a bit or refinement has smoothed it. Note too that you cannot let go of the steering wheel for more than a few seconds or the system senses your inattention and alerts you to take control of the wheel. ProPilot seems less useful in city driving as there frequently are no side lane markings for it to read. There’s also a blind-spot warning system, rearview monitor, automatic emergency braking and pedestrian recognition, rear cross traffic alert, rear automatic braking and rear sonar. All of those are standard on the SV trim. Add AWD to that, including a button to lock it on when conditions are slippery, such as our latest snow. Inside, the Rogue feels roomier than many compact utes and crossovers, plus it’s fairly quiet and offers a handsome interior that is comfy. 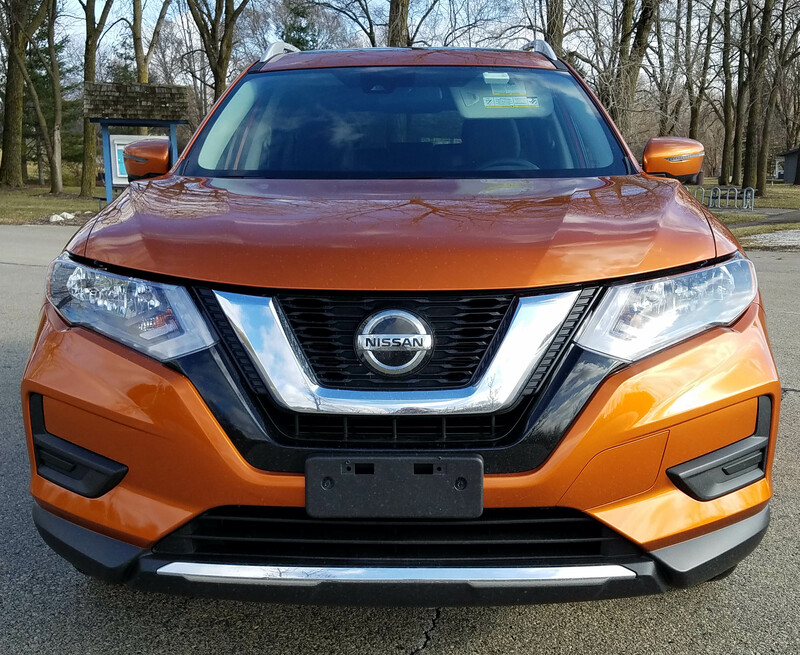 The orange test vehicle featured black patterned cloth seats, a black dash, gloss gray door trim and black gloss trim by the shifter and center stack. Moving up to the SL trim nets leather seats, plus adds more comfort and convenience features. As it is, the SV’s seats are well contoured and comfortable, providing especially good lower back/kidney support. Front seats are powered and heated, and there are two memory settings for the driver’s seat. That and the heated steering wheel (much appreciated in Wisconsin), are part of the large and pricey Sun and Sound package mentioned earlier. 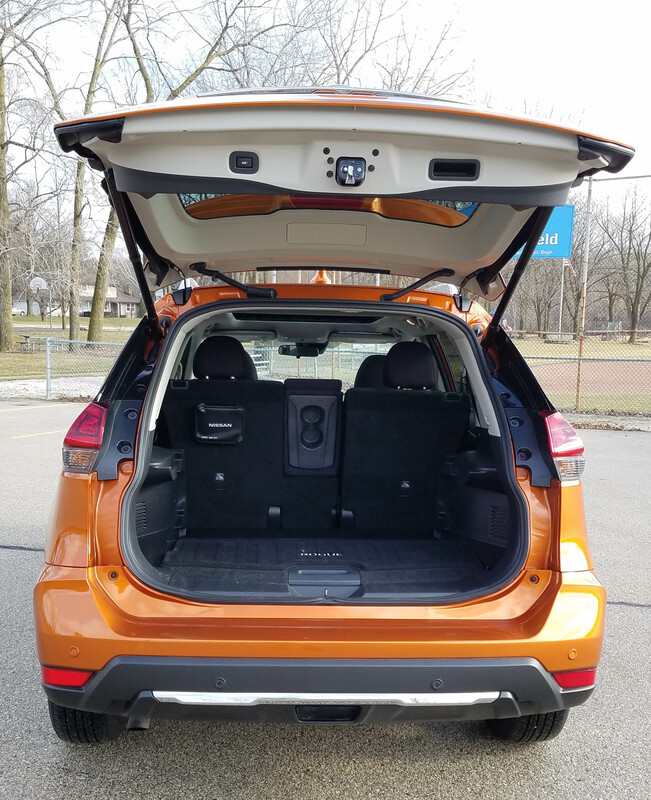 The package also includes a navigation system with 3D graphics, an HD radio with satellite radio and traffic info, and an Around-View monitor that shows you all sides of the vehicle, an aid in parking. A fine Bose stereo with nine speakers along with an electronic parking brake, 18-inch alloy wheels, and a panoramic sunroof also are included. 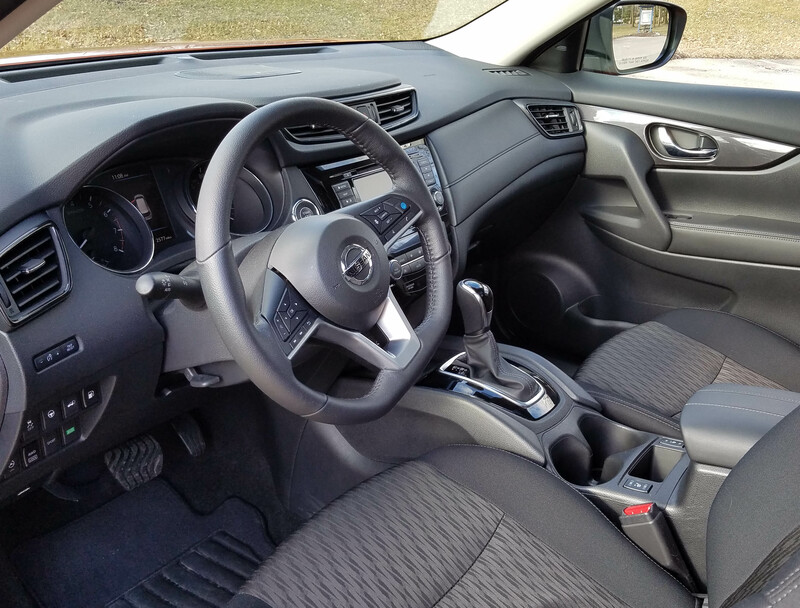 Rogue’s main gauges are well laid out and easy to see, there’s a manual tilt/telescope steering wheel with the usual assortment of radio, cruise and phone buttons on the hub, and a dual climate control system is standard, with easy to adjust knobs and buttons. I also like that the steering wheel is flat-bottomed, making it easy to get in and out. Plus Rogue’s driver’s seat powers back once the driver’s door is opened. Nissan’s infotainment screen seems small, although it’s a 7-incher. I think the size of the numbers and digits on the screen create a perception of smallness. It was harder to read than the screen in last week’s Forester. This one functioned well, including touchscreen buttons you could program favorite channels on. However, the buttons did not respond to a gloved hand, whereas the Forester’s did. Up top is that big sunroof and in back a power hatch with a wiper. Cargo space is generous under the hatch and the rear seats fold down in a 40/20/40 split. Those seats also slide forward or back to increase rear passenger legroom, or boost cargo space, as needed. So this is a fine compact crossover for hauling family, or stuff. There were a few irritants too, but none major. The heated steering wheel never got real hot and took about 10 minutes to fully warm. I also could find no way to shut off the annoying beep that the lane departure system uses. In city driving these systems can become distracting. I also was disappointed by the Rogue’s gas mileage. The EPA rates the Rogue SV AWD at 22 mpg city and 32 mpg highway. I got 21.5 mpg, includeing about 30% of my time on a highway. While it was cold during the drive it certainly was not unusual for a Wisconsin winter. Last year I’d gotten 26.2 mpg. 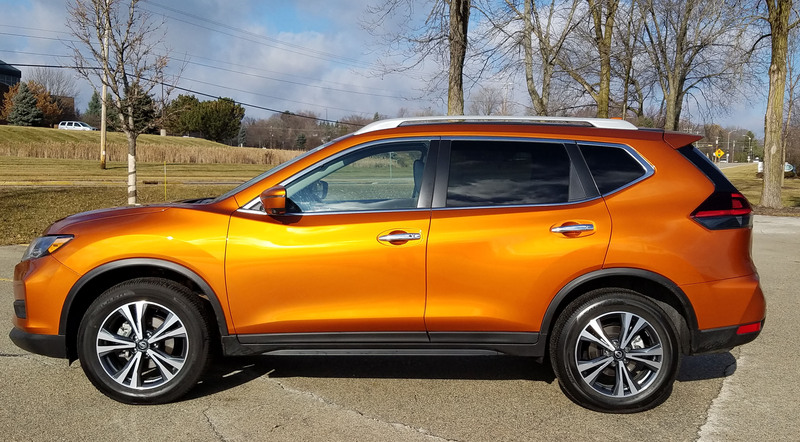 As mentioned above, the Rogue’s starting price is attractive and even with that big option package, floor mats and a big cargo mat, plus $395 for the bright metallic orange paint job this hit just $32,770. A top-level SL lists about there at $32,435 including delivery, but that’s with front-wheel drive. Adding AWD is about $1,200 extra on any model. Also, for those who demand better gas mileage, Nissan offers a hybrid model in SV and SL trim. Those start at $28,645 and $32,585, respectively. The hybrids are rated at 33 mpg city and 35 mpg highway. That’s more like it! Bottom line, there are compact crossovers that handle better, the Forester and Mazda CX-3 and CX-5, for instance. But the Rogue is a happy blend of comfort, roominess, decent looks and great value, exactly the reason you see so many on the streets. Hits: Roomy interior, decent ride, big sunroof and supportive and heated front seats and heated steering wheel. Infotainment screen easy to work, flat-bottomed steering wheel, power hatch, 2-memory seats, plus ProPilot Assist and other more mainstream safety devices. Previous Post2019 Subaru Forester LimitedNext PostSo long newspaper life, but wait, there’s more!